Historically, women have served as both paid and familial caregivers. While the demographics are shifting, with more men and millennials stepping up to help care for disabled and aging loved ones, the majority of caregivers remain women. It is critical the industry consider the short an long term effects of caregiving on women’s health and well-being. Being a caregiver can provide a sense of fulfillment. But it is a position that can lead to anxiety and burn out. 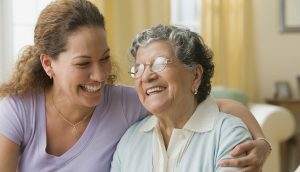 By understanding the consequences of caregiving we can anticipate and better support the needs of the caregivers who remain an indispensable part of our health care system. The population of those over 65 is expected to double by 2050, and most of those will want to age in place. In home care will remain in high demand. Traditionally, these jobs have been filled by paid caregivers, but low wages and a general lack of respect for the work have make the workforce vulnerable at a time when these skills are critical to supporting the independence of people with disabilities. Lets engage with our caregivers and consumers to identify problems and learn how best to meet their needs and improve the quality of the job. Preparation is key. CIL’s providing self directed services can help the consumer and caregiver to be on the same page about personal preferences so they can work together each day. They can provide education and training of the skills they need. Things like: how to recruit and interview caregivers, how best to communicate personal needs and preferences, what is a back-up plan, how technology can help and where to get it. Consumers can be in control of their care, and caregivers can receive the support they need to do the best job possible.